The new SATO HT200e, 2" thermal standalone printer, is designed to meet your printing needs. With end-users in mind, this printer is easy to use with its preset formats, a large LCD screen for easy reading, automatic calculation and provides touch-of-a-button printing. The HT200e comes with enough memory to store 300 presets for Key 'N' Print operation. Need more storage for your custom presets? Just add an external SRAM memory card that instantly lets you store an additional 1000 presets or 2000 presets (1MB card or 2MB card respectively).AC operation is a standard feature, but with the battery option installed, you can carry the printer out to the field for quick and easy price label printing in supermarkets and other premises. An optional barcode scanner can also be connected with the new SATO HT200e to offer greater convenience. A label design application is also offer to you for online printing thru RS232c interface.SATO's new HT200e is a new smart stand-alone printer. 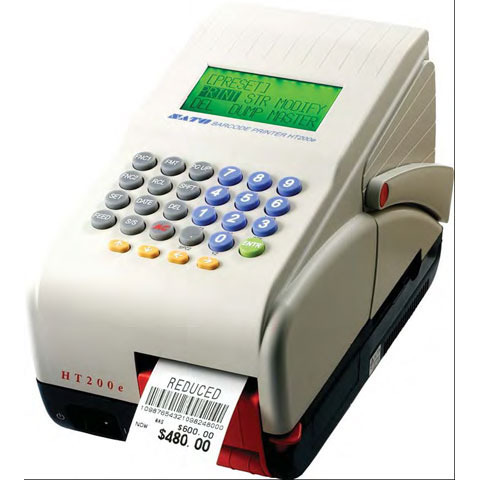 This unique machine is extremely user-friendly and prints labels and barcodes at the touch of a button. It's fast, versatile, easy to use, and provides low cost solutions to a variety of labeling requirements across many markets.